Roan had to ask, didn't he? This is The 100. Literally everything can go wrong and probably will. Melted ice rivers, mutiny, stray arrows... times they are tough. As much as I enjoy Clarke and Roan's mutual respect for each other, I got giddy when Roan and Bellamy were sharing scenes. They are so similar in their deep unwavering loyalties. The problem is that they are loyal to different people/groups of people which makes it near impossible that they'd ever be real friends, but I'd watch that episode. Just the two of them skipping through the forest playing never have I ever. I loved Luna shrinking John Murphy. Everything from her cutting right through his sarcasm and self-loathing to him, the resident survivor, seeming genuinely shocked that she wouldn't want to survive if it meant being alone. She is just as much a survivor as he is, after all. 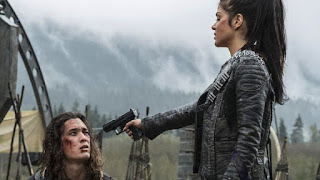 Growing up a nightblood on the ground couldn't have been a picnic, but she made it through and she should have been killed in the nightblood showdown that put Lexa in charge, but she didn't. Her entire peace cult got hit with radiation and died and she is still standing. She almost survives in spite of herself and it's interesting to see how that has shaped her compared to how surviving at all costs has shaped Murphy. She's found peace where he only sees the ugly side of life and humanity. Is it possible that she could teach him a thing or two? Maybe a mantra that he can repeat when he's feeling volatile? That'd be something to see. I remember back in season one that this show reminded me of a lot of other shows and movies. Billie even mentioned the fog being reminiscent of the smoke monster from Lost. This time we got a little Fast and Furious action with the rover chase. I think Vin Diesel would be proud. And while we are strolling memory lane, the mob wanting to take Ilian out for blowing up the Ark was so season one when the mob strung up Murphy when they thought he killed Wells and Murphy wanting to kill Charlotte. Monty even brought it up. It goes to the point Roan made about what happens if they do all survive... more fighting and death? Which Luna mentioned a few episodes ago. I think the writers are trying to tell us something. And then Kane, Monty and Jaha worked together to talk Octavia down and save Ilian's life. I got chills, y'all. It was like a little love letter of hope from the writers to us. A reminder of why humanity is worth fighting for. Almost always, victory in this world has meant saving a select few with the death of others. Clarke killing everyone in the mountain to save her friends. Clarke and Lexa fleeing camp and leaving everyone else to get blown up. Even back in season one when they used the dropship fuel to burn the grounders that were attacking. This time we got a lighter stance. No one died. Everyone walked away with a conscience that was clear. Or at least with a conscience that wasn't tainted further in that moment, because let's face it, Octavia is a murderer. She is Skairippa and finding herself standing in the same spot that Pike was standing when his actions sent her on this rampage was maybe a little cheesy but wildly effective. Except maybe Miller's dad. That guy's gonna lose his job, right? Lawd, so much double crossing. It's hard to rate episodes that are consistently good. 3 out of 4 love letters of hope. Clarke drew a picture of Lexa last season and it's now hanging in her room. Cute. There were two trios of unlikely but unbelievably engaging teams. Clarke, Bellamy and Roan took a road trip. Luna, Raven and Murphy planned one. Noooooo. Will nightblood save Raven?? Kane seemed so upset when Octavia took off. Granted, not upset enough to actually chase after her, but I think he really sees a lot in her. Or maybe I'm projecting because I see a lot in her. Jasper: "Cheer up, Jaha. Once you accept there's nothing to be done, there's nothing to worry about." Jaha: "We'll find a way." Jasper: "I found the way. 'If you never did, you should. These things are fun, and fun is good.' Dr. Seuss." Bellamy: "Octavia, I thought you were dead." Octavia: "Octavia is dead. She died when you killed Lincoln." Bellamy: "Please don't say that, O. Okay? I'm your brother." Octavia: "Why do you think you're still alive?" Monty: "Locked and loaded. I do, however, feel the need to reiterate you're about to drive the last ten barrels of hydrazine known to man, a cargo which Raven needs every last drop of, through hostile territory packed with warring clans, over uneven roads where one serious bump could cause an explosion that would not only kill all of you but would wipe out mankind's only remaining chance for survival." Roan: "What could possibly go wrong?" Bellamy: "All you care about is your own people." Roan: "Yeah, like you're any better. That's all anyone cares about. Except maybe Clarke." Roan: "And if we do save everyone? Then what? What happens once you've turned us all into nightbloods? Do we just keep on killing each other?" Kane: "If we let them descend into darkness, there's no coming back." Octavia: "It's the end of the world, Kane. Darkness is all we have left." Niylah: "We're not so different after all." Jaha: "From the ashes we will rise." What could possibly go wrong? :) Seriously, I know conflict is the heart of drama, but these guys simply cannot catch a break. Although I was expecting all ten barrels to blow up in a blaze of bitter hopelessness, not just one destroyed by an arrow. Can Raven manage without one of the barrels? Hey, can Raven recover from another whatever it was that just felled her? I'm starting to like Roan again. And I loved Clarke's face when Kane hugged her. I'm constantly being distracted by everyone who's absent from the episodes. This time we missed Abby, Jackson, Emori, Miller, Bryan, Harper and Riley. The last one as probably hiding from Roan though. It's especially jarring in the laboratory where half the people are always missing from scens both this week and last week.